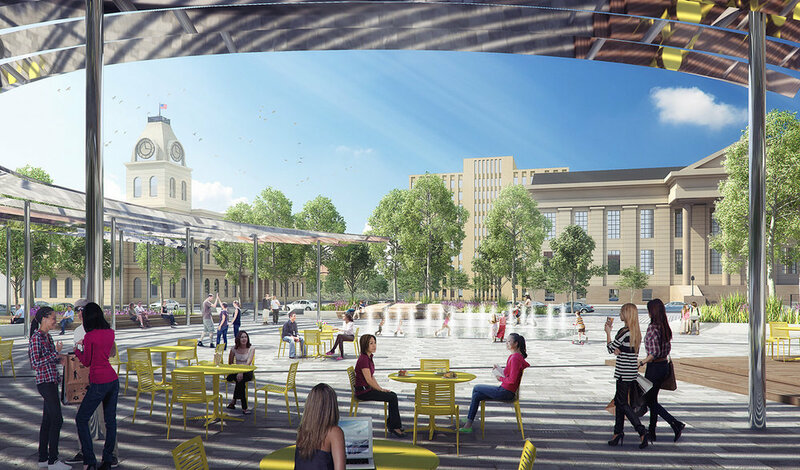 Reimagining a downtown's public square to connect the community. Jefferson Square, a 1-acre urban park situated near City Hall, and surrounded by private and governmental offices, is THE outdoor civic open space in downtown Louisville. Lost in overgrown plant materials, wandering circulation paths, and a collection of first responder memorials, MKSK is assisting the city in re-setting Jefferson Square as a platform for public engagements and improved connectivity to nature, program, and neighborhood. MKSK is working to promote an inclusive process and transformative design that not only honors the legacy of the space, but frees it from its current constraints and embraces the dynamic ambitions that are being desired of this public square.